I am working on an RF energy harvesting circuit. Problem is that the charge slowly builds up in the capacitor and the output voltage from the DC boost increases slowly. The output voltage is being used by an RF chip. I want the RF chip to turn on only when the output voltage reaches 3 to 3.3V. Now if the RF chip is on it will start draining the voltage right when the output voltage reaches 1.8V. I do not want my RF circuit to turn on when the output voltage is 3V. Now there is a voltage indicator pin of the DC boost that turns high when the voltage reaches 3V. So can I use a NPN or PNP transistor circuit and use this voltage indicator pin to turn on the RF chip when the output voltage reaches 3V? Is a PNP better or an NPN? A p channel mosfet to switch the rf chip power would most likelybe a better solution. Also, re-read your post as i think you contradict yourself. With these energy harvesting gadgets you often have a very limited power budget. Every uA counts, which means high input impedance, which means sensitive to noise. A circuit like this is not very difficult to design, but it is also not trivial. My first thought was also a MOSfet, Could be N or P -channel (You can switch eighter GND or Vcc). A disadvantage of MOS fets is probably the spread in Ugs. This may often vary quite a lot over different batches and has a high tempereature cooficient. A better circuit is probably to make a schmitt trigger with a few bipolar darlington transistors. But you do not seem to have much experience with designing analog circuits. There a lots of other options. One option you mentioned is to use a (boost) voltage regulator. There are 1000's of different voltage regulators, and some very likely have built in protection circuitry which turns the output off if it can not be regulated properly. Another class of IC's are the reset controllers. Little IC's that generate reset signals for a uC if certain conditions are not met, and supply voltage is one of those conditions. Yet another option could be a microcontroller. Some ATTiny with the brown-out circuit enabled. How much current does your RF circuit need? Vcc of other IC's can often be switched directly from a pin of a uC, you could put some pins parallel to be able to supply more current. When I typed "schmitt trigger" in DuckDuck, one of the first hits was from disturbia. (Oops, "nexperia" almost right). They seem to make schmitt trigger circuits, an without doubt have some different models and some might do exactly what you want. - How much current does your RF circuit need ? - Where is the power harvested from? What are the caracteristics of that device? - How much current may your switch device consume ? - Amount of circutis needed ( A few can be hand adjusted for levels. for 1000's of circuits you want a reliable production process, no potentiometers, etc). A long time ago (years!) Davey Jones had some talk (he talks a lot) about a development board for power harvesting applications. It was from a company specializing in that stuff, with extreme low power uC's. I believe they could run a uC and LCD from 1V2 @100nA or similar. And why the 3V3 ? With power harvesting applications you want to be carefull with your input energy, and therefore circuits often run on much lower supply voltages than the "standard" 3V3 often used for logic. Even AVR's can run happily from 1V8 or lower and a lot of the RF chips can also run from a lower Vcc. Lower Vcc is lower power. This is not lineairly, but (somewhat) quadratic. If you halve Vcc, power consumption will be 1/4 of what it was before. A few 100mV can make a significant difference. I put A bc547 and it is turning ON with the voltage signal pin but is not giving enough current for the RF chip to run. The RF chip needs 16mA. If I directly connect the RF chip to the output when it reaches 3V it is able to power ON and then send a data packet but when I am doing it through the transistor though the voltage reaches 3v I am able only able to get 1mA of current.Also when I am using the transistor the signal which turns the transistor ON stays high only when the voltage is between 3V and 2.83V and it might be that since the capacitor is not draining fully at this voltage range the current is low. If I directly connect the RF chip to the capacitor output when the Vcap reaches 3v it gives more current as it drains fully till 2V. What shall I do? Can you please post a schematic of your circuit? My job does not permit me to reveal details about the schematic. But can a schmitt trigger be used as a switch to switch the input voltage between 2 and 3 to 3.3V ? All you sparkies can decide the best way to switch the RF power. But, if there is "Vcc" power always available for a small micro, then it could be in power-down sleep drawing next to nothing, with wake on pin-change when the monitored voltage becomes a logic 1. My job does not permit me to reveal details about the schematic. My concience does not allow me to keep guessing at incomplete data. In principle, Midwest Jim's suggestion is a good one. The challenge is that, especially in RF devices, the ground path may be subject to unexpectedly high currents with a corresponding unexpected voltage drop across the FET. Something to mitigate this might be in order. The first-order suggestion is a simple capacitor but that might not, in some circumstances, be the best choice. A second challenge also appears with RF devices. There may be more than one "ground pin". It is likely that one or more will be associated with power and one or more associated with the RF output. The specs rarely allow much of a voltage difference between various grounds. Then, the question becomes what to switch and what can you not bother with. The consequences of this question are substantial. I think "high side" switching with a PFet is a better option when the device is a small RF module. The Vds on the NFet level shifts the Ground, and for the el-cheapo RF units it can impact the frequency of transmission. For many devices the "Low Side" NFet is the simpler solution, but it would require some testing when used with an RF device, (best accomplished with a spectrum analyzer, which might be beyond the OP's current skill level). My concience does not allow me to geep guessing at incomplete data. Can we use your services as a consultant to the project? If yes after our initial funding raise we will get in touch with you. My email id is : infibit@gmail.com .Please drop in a test email. Thank you for your suggestions. So what NFET do you suggest? I used a BC547 transistor and it is giving me only 0.7mA and my RF module needs 8-10mA. The entire current of the capacitor is not getting discharged through the BC547 NPN transistor. What shall I do in this case? I used a BC547 transistor and it is giving me only 0.7mA and my RF module needs 8-10mA. 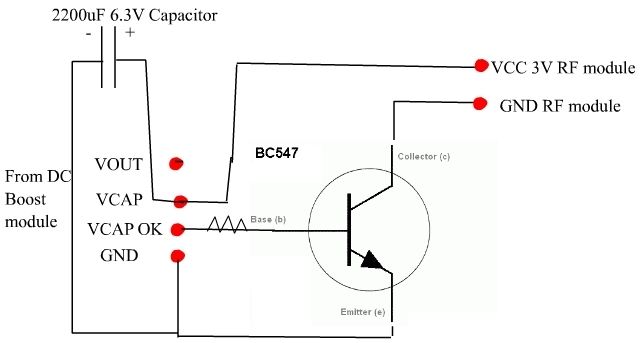 The entire current of the capacitor is not getting discharged through the BC547 NPN transistor. What shall I do in this case? Why is the NPN transistor not giving the full discharge current of the capacitor? Because when I connect the RF module directly to the capacitor when the voltage rages 3V, then the RF module turns on but when I connect the RF module via the BC547 the RF module does not turn on. So why is BC547 giving less current? And what N Channel MOSFET do you suggest? Please suggest something that is easily available. ground of the RF Device and the base connected to RF enable via a resistor. this base resistor a fair amount to reduce wasting current in the base. this base transistor a fair amount to reduce wasting current in the base. Right now my base resistor is 970 ohm. So is it because my base resistance is lesser than 4.6K that I am not getting enough collector current. Finally what base resistance do you recommend? And if I put a higher resistance will it solve the problem? RF enable is 3.3V Please let me know. Update: Edited the circuit diagram to show the right connection. Is this the same as VCAP OK? If the drive is 3.3V then 3.3V less the base voltage of say 0.7V= 2.6V/910=2.8mA base current so it's a lot more than necessary but OK. Check the transistor pinout and make sure it is wired as per the diagram, at times some transistors variations have funny pin-outs. I increased @avr-mike the base resistor to 22K ohm and the output current through the transistor feel down further to 0.32mA compared to 0.7mA. What do you suggest? Please let me know. But what is the voltage CONTINUOUSLY at the base resistor ( VCAP OK )? You just can't guess things, it all depend on the drive voltage. You should be using an N-channel FET,to minimize waste...the gate will take "zero" power & the fet drop driving the load will be about zero volts. Show a complete schematic of everything you have, not a bit of a piece here & there. Include all of your voltage measurements too. I have to say that I find incredible that this guy has a job designing electronics. Yeah problem was that the emitter and collector were reversed. Solved. Thank you guys. VCAP_OK is signal by the boost converter that the storage element voltage has reached 3.3V or 3V as it is programmed by configuring resistors. And what voltage do you have on that pin when the voltage is in fact okay (maybe with/without load)? How much current can you draw on VCAP_OK?